The substrate under the floorboard - Requiredcollateral material for laying parquet. It helps to smooth out the irregularities in the substrate part, promotes gender mute the sound of footsteps, prevents the penetration of moisture and its destructive effects on the parquet, and - leakage of such a valuable heat from the room. 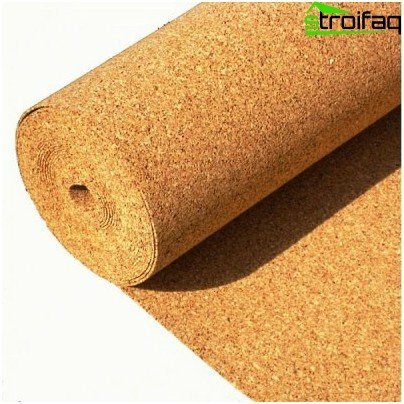 Types of substrates enough: cork, made of foamed propylene Tupleks and others. It is important to choose the best, most fully corresponding to the needs of the consumer to a functional and qualitative properties. Consider all kinds of stages. When you need extra moisture insulation? This is a cheap substrate. 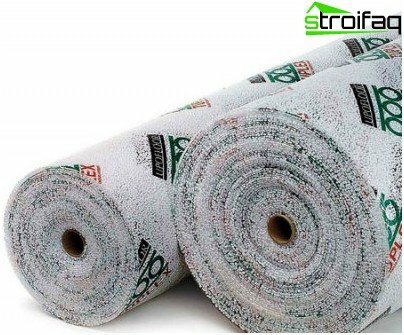 Its main advantage - it is an excellent vapor barrier, it also meets all requirements for installation, perfectly dampens vibrations from walking on the floor, improves its thermal and sound insulation. However, it is short-lived - a complete breakdown of the material occurs in 7-10 years (do not forget to subtract from this period of time spent on roll stock). After the expiry date, it is converted intopowder and loses all the positive properties. The second fundamental flaw - it's a fire hazard foamed polymers. They ignite even easier than wood. It should take into account the high toxicity when burning, because of which many are not at risk of acquiring this material. This type of support has traditionally been used byparquet. 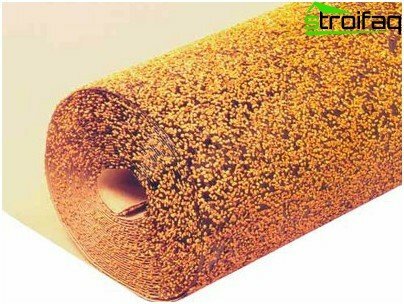 Cork - the best natural heat and shumoizolyator, has good shock-absorbing properties, of course, strong and elastic, durable, all-natural product (does not contain aromatic hydrocarbons and formaldehyde), it can rightly be attributed to the excellent, high-quality materials. Often used when installing the flooring in the nursery, when installing underfloor heating. 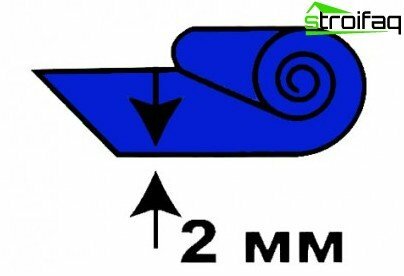 Such a substrate is produced of different thickness (1.510), under the flooring material should be used only 2 mm thick. 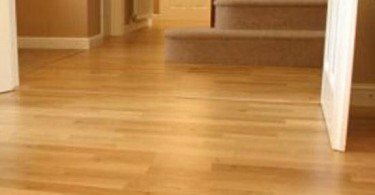 When using a thinner material - it will crumble, greatly reducing the life of the floor. When using thicker jams occur, the excess load on the connection of lock parquet. It is worth noting that the cork substrate under the floorboard has one serious drawback - tube swells from the water. It can be eliminated if you buy a substrate with a polyethylene layer or apply it independently as waterproofing. This material, consisting of 3 layers. The bottom layer is a porous film, the moisture passing in the middle layer, which is packed with beads designed to maintain a constant height (between the balls present a ventilated air layer). The top layer is a plastic film. Such a substrate will be particularly effective inthe event is not enough dried ties, as well as the presence of condensate on it due to the irregular heating. Through the moisture will penetrate the pores in the middle layer and then through the air well weathered ducts around the perimeter in locations where there are gaps between the wall and the floorboard. Thus, significantly reduces the risk of damage to the floorboard. Perhaps Tupleks - this is the best substrate under the floorboard to date. It can compete except with cork, the more that prices are approximately the same. 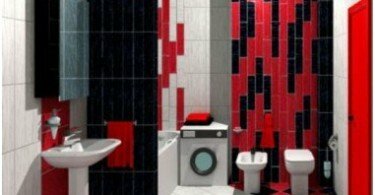 This material based on a bituminous mastic isand actively promote the new product on the Russian market. However, along with such indisputable advantages Parkolaga as an excellent heat and noise and moisture insulation, durability, there is a serious flaw mastic asphalt in large quantities emit formaldehyde, especially in hot weather or when near heat conducting pipes. That is why the materials, having in its composition of bitumen, banned in many countries and institutions. This layer is a welcome addition,improving properties of the substrate material. It provides good thermal, hydro and sound insulation of parquet. Folgiruyut often foamed polymer material, but also its other species. It is advisable to use when laying flooring on joists with a rigid fixation of the board. This question is of interest to many, because such a characterization has a fundamental effect on the performance properties of both the substrate and of parquet. Therefore, it is devoted to detail. This material should not be too thick ortoo thin. According to the standard, when laying parquet maximum height difference can be 3 mm to 2 m ?. These figures are derived from the substrate shrinkage and drop its inception. Standard and optimum thickness of parquet substrate - 2 mm, allowing to stay within the allowable difference. Soft materials such as cork or foam substrate is compressed under pressure. If their coat is great, it will provoke a large height differences. And this, in turn, will create a backlash of lock joints on the floorboard, which will cause increased wear a lock connection, the emergence of a squeak. It is noteworthy that the flooring starts to creak, and the lock - break off - not immediately. Defective packing will be able to find only a few months. Almost all kinds of substrates (except Parkolaga andTupleksa) are porous, unprotected from moisture. When laying on a dry lining sheets or plywood additional moisture insulation is not needed. 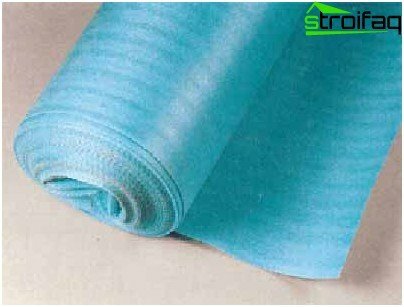 If the styling floorboard going to tie, then under vlagonezaschischennuyu substrate is recommended to lay a polyethylene film. For properties known ties: on the surface due to the temperature difference between the dew comes with time. We have considered all of the most popular types of substratesunder parquet, describing their basic properties. Which of them prefer to - you decide, however, the market leader in terms of quality and performance properties remain confident until the cork backing and Tupleks. If finances allow, the better buy it of them.